For the first time ever, German 10-year sovereign bonds dipped below zero. With that event, Germany joined Japan and Switzerland in the negative 10 club. As testimony to the ridiculous nature of ECB policy, Germany’s 10-Year Bond Yield Declines Below Zero for First Time. Germany’s 10-year government bond yields tumbled below zero for the first time on record as a weakening global economic outlook fuels demand for perceived havens. 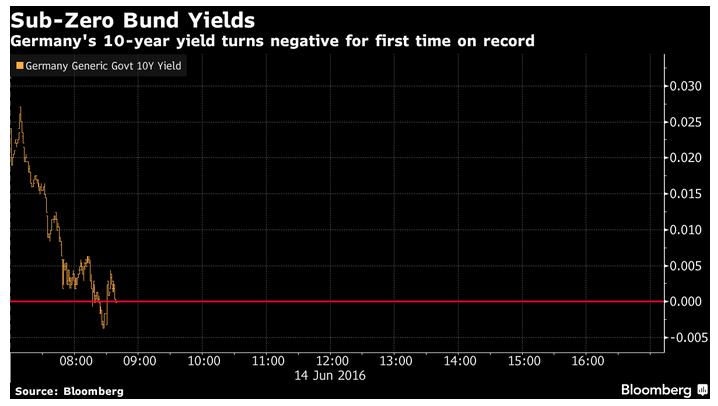 The nation joined Japan and Switzerland in having 10-year bond yields of less than zero. The plunge in yields, which has been driven by European Central Bank’s policy of negative interest rates and asset purchases, has accelerated after the weakest U.S. payrolls data in almost six years was reported June 3, and as polls indicate Britain’s vote on remaining or exiting the European Union is too close to call. The idea that 10-year bonds trade at negative yields as a “hedge against uncertainty” is one of the silliest economic comments this month.